Could you part with your vinyl record collection? Probably the first blog we noticed about full-time travelling in a motorhome was ‘Eric and Shazza”Big Momma’s Great Adventure’ whereby Eric, who we briefly met in his role of Caravan Club Site warden, realised he needed to clear out his, quote ..” tat cherished possessions” before embarking on the adventure. Now, while we still realise a final plan about touring, downsizing or whatever, we too need to clear out our ” tat cherished possessions”. Furniture? No, too soon. White goods? No, too soon. Every computer or phone we have kept in case the current one breaks, Yes .. Once I’ve formatted the hard drive and dunked it in a bucket of water for luck, I’m the sort of person that still cuts up old credit cards into a million pieces and put them in different bins ‘just in case’. What about the old records? No, I can’t, … Why? I just can’t. If you are anything like us, you will think the best era for music was from when you were about 10 years old to when you were about 16 years old … In our case ’77 to ’83 …(everyone born 66/67 currently nodding). You will remember the exact shop you bought every record, how you saved the money, the excitement of the bus journey to town. On the way home you unwrapped the cellophane, held the record to your nose, not sure why, but they even smelt great. The cover alone could provide hours of interest before you even got to play it. Then, click, whoosh, pop, crackle, pop, crackle, here it comes. On the first day you may return the needle to the start twenty times over, how your Mum loved that (not). That’s why I can’t. What has happened since 1983, besides the emergence of CDs, MP3s and streaming (ask a grandchild to translate if necessary), well, apart from the very occasional play, we have carted a good few hundred albums from house to house as we grew up, got married and progressed the property ladder. Why, so that when we die, some house clearance employee will nod in their direction and offer our grieving, or celebrating, children a ‘tenner’ for ‘that lot’. I see sense, it’s time. I decide to jump in the deep end, can I give away my most cherished album, the first album I ever bought, probably still my favourite album, The Jam – All Mod Cons. A well respected colleague is leaving my former workplace after twenty five years service. She loves music, She knows my love of music, I have no money for a present, I break the spell and gift my most cherished album. Now it is easy, eBay, to be honest if someone had said £100 the lot we would have taken it but decide to be patient and list albums by group or genre in mini bundles. The bids start coming in, we are shocked, there is an appetite for vinyl and to cut a long story less long, we have generated over £1100. I hasten to add this will still be below the original purchase value, no capital gains here Mr Wilson/Mr Heath (the last reference is for people born 50-56). Approx half this money has been ploughed back into the caravan through improvements, product purchases and even site fees. The remaining £500 was stashed in our ‘running away fund’ but has now been requisitioned towards site fees on our 50 day 50th birthday treat to ourselves next year. Last thoughts. No regrets, the memories and joy these records provided can’t be taken away and they are now paying for even more memories. Note: If you follow a similar path be prepared to line the pockets of eBay, PayPal and various delivery companies. To get £1100 in our pockets the actual sales value was probably nearer £1500 (a necessary evil, but I really objected to paying eBay 10% fees on postage costs that I had to pay out in full). Now, what else can we sell? 8 years ago, we moved to Spain and were clearing many possessions. 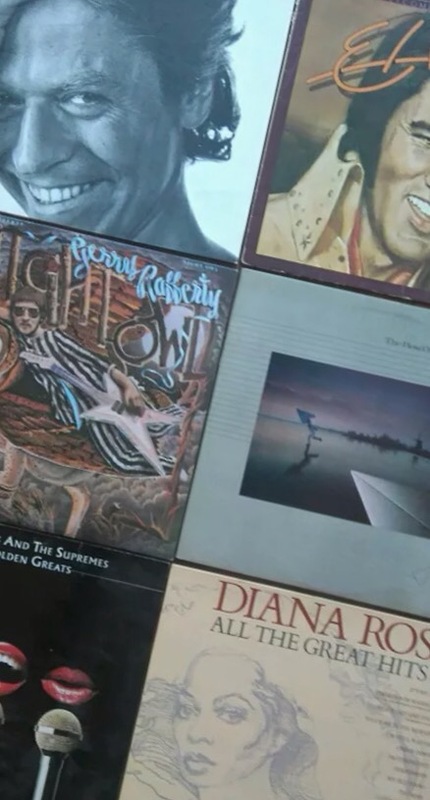 My cherished vinyl collection (boxes of them) went to a local charity shop. I even pointed out a few of them telling them not to sell them off cheaply including a first press release of New Order’s Blue Monday, the first number one available in 12″ only, which cost more to produce the initial batch of singles than the price they sold for. I shudder now to think of the value in those cardboard boxes.